One hundred years have passed since New York's Pennsylvania Station opened its doors. The building stood in the middle of Manhattan for more than 50 years. Today, only the underground area remains. Lorraine Diehl wrote a book about Penn Station. She remembers playing there as a child. LORRAINE DIEHL: "Every space just sort of triggered your imagination. 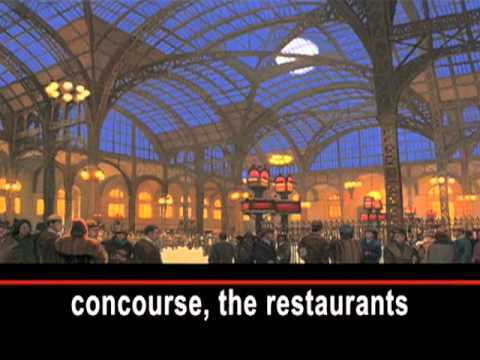 For instance, when you walk in from Eighth Avenue, that was the great train shed, the concourse, and it was this extraordinary space of great vaulted iron columns and a glass ceiling, and the dust particles would just drift in and just be frozen in space. And you felt that this was a room of journeys. Your mind took a journey before you ever got on a train in this space." The old Penn Station was covered with statues of eagles and young women. Artist William Low never saw the building. But he used old pictures and descriptions to make a picture book about it. WILLIAM LOW: "It's just awe-inspiring. It would be like the first time I saw the Grand Canyon. The idea of this immense space -- you can't put it into words." Low painted the separate rooms of the station: the concourse, the restaurants and waiting room. The Pennsylvania Railroad Company was the owner of Penn Station. By the early 1960s, the company was failing. So it sold the above-ground building to the developers of a sports center -- Madison Square Garden. WILLIAM LOW: "It was torn down. And the sculptures were ripped apart and unceremoniously dragged and dumped into the New Jersey Meadowlands." Only six architects protested when the building came down in 1963. Slowly, other people came to regret the loss. This led to New York's Landmarks Protection laws. PEG BREEN: "Nobody is happy with Penn Station as it exists in New York today. People who never even saw the original Penn Station mourn its loss. It was probably the greatest architectural crime that has been committed in New York City." Peg Breen heads the New York Landmarks Conservancy. Her group has been working to turn an old Post Office building across the street into a new version of Penn Station. PEG BREEN: "This was built in 1912 by Charles McKim, the architect of Pennsylvania Station, and it's the architectural twin to the old Penn Station. It was built when public spaces were built to honor the public, and when you walked into a building, it said, you know, 'This is a great city, you are a good citizen in a wonderful space.'" The changes are expected to cost more than $1 billion. The building can never really take the place of the old Penn Station. But Breen's group says it will give train passengers arriving in New York a beautiful door into the city. I'm Barbara Klein. Смотрите видео Some New Yorkers Don't Miss the Train -- They Miss the Old Station и вы с легкостью выучите английский язык. I'm one of those people who never got to experience it in person.... yet still mourn it's dismantling every time I enter the city through that disgrace of a station that stands? today. When I? was 9 yrs old I remember entering and walking through this place with my father..I was amazed by it....awsome! To bad is couldn 't be saved as a city landmark..sad! Thanks for the video, I used it for an English class about old buildings with a new use.? what a superb video. tyhanks? for posting. I suppose the nearest thing to it here in the UK is either Kings cross or St Pancras.